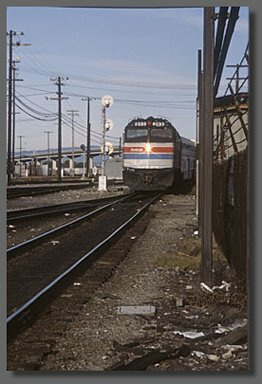 In February of 1981 I was in Roseville, returning from a trip up to Oregon, and I had to switch to an Oakland train. As soon as I hopped off the southbound (West Colton bound) lumber drag I had been riding, a string of cars next to me with several empty gondolas started moving, so, figuring that it was headed for Oakland, I hopped aboard, pleased with myself for only being "on the ground" in Roseville for under a minute. As often happens, my luck ended a half hour later when my train broke up in Sacramento. In my haste to bag it on the fly and the curvature of the tracks in Roseville's departure yard, I failed to notice that there was only one unit, and these were just cars in transit. 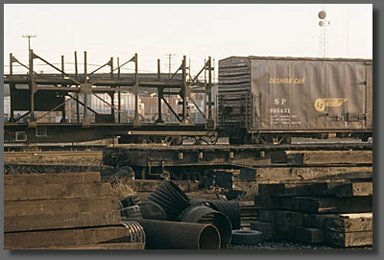 Not being in any particular hurry, I hung out in the yard for a few hours before bagging a first-generation empty autorack (the kind we dream about now) and rode it, somewhat exposed, into Oakland [below]. For some reason, my zeal to get off the tracks and return home was waning, and I decided to purchase another in a series of White Ports and sleep in the yard that night. 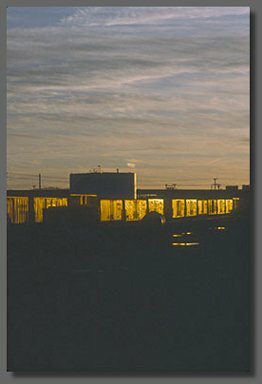 There was a long deadline of empty boxcars adjacent to the Oakland Army Base to sleep in, and I was treated to a cool sunset [above]. 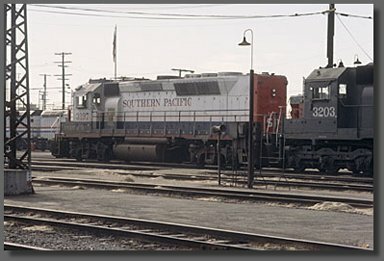 The next morning I poked around the West Oakland freightyard, watching the southbound Amtrak Coast Starlight passing a litter-strewn right-of-way [above], and over at the fueling racks was SP 3197 (GP40-2P), repainted in Bicentennial colors [below].